A cupcake themed bedroom is a really cool bedroom idea that any girl is bound to love from toddler to teen. Cupcake themed bedrooms are extremely popular among a wide age group of girls and is it any wonder? Cupcakes are cute! There are lots of different ways for you to incorporate a little cupcake magic into your bedroom decor from cupcake bedding to cupcake artwork and more so let's have a look at how to create the best possible cupcake bedroom ever. The main piece of furniture in a bedroom is the bed which is why I've decided to start this creation of a cupcake bedroom with cupcake bedding. I've compiled a selection of cupcake comforters, bedspreads and duvet covers below for you to choose from. I would then just use plain sheets to compliment the set you decide to use. A gorgeous touch is to also add some throw pillows to the bed, you can add cupcake ones or plain ones in colors that match the bedding. Having throw pillows on the bed adds more texture which makes the bed appear more opulent and will also have your child feeling very grown up. Cupcakes twin 68 by 86 printed microplush set comes with one 20 by 26 sham. You can find some great cupcake pillows at the site opposite, while I absolutely love the 'sweet' pillows below! 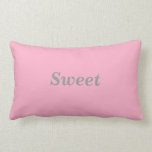 If you want a delicious looking throw pillow then these throw pillows for girls really take the cake - the cupcake! Yes, there are some cool cupcake inspired throw pillows here that all look mouthwateringly good. Cupcake rooms can be made using a neutral color on the wall, but most of the ones I've seen have used a pink and/or purple color palate. Think of your child's favorite color and then make sure your cupcake bedding and accessories will match and you'll be fine. When it comes to the walls I tend to stick with a plain color and add visual interest through artwork and wall decals. 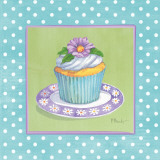 The artwork can be canvas prints or posters featuring cupcakes. The Keep Calm parody posters are very popular at the moment and my teenaged niece actually has a Keep Calm and Eat a Cupcake poster like the one opposite in a green color. You can get them in a range of different colors to match the rest of the room's decor. This poster would certainly be a hit among a range of ages so is a great buy for your cupcake inspired bedroom. 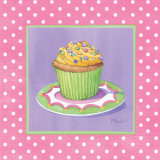 There are other types of posters that will look great on the wall such as one of these cupcake posters pictured below. These are very similar and are in fact part of a set which all have different colors so that you can find a perfect match for your bedroom palate. If none of these art posters look right for you you can also find a selection of cupcake canvases at places like Walmart. Of course you don't have to have just posters on your walls as you can also get wooden signs like the one opposite. I love the cupcake wooden sign, I could only find it in pink online, but I can get it in white at some of the home decor shops near where I live. The latest in wall decor is the wall decals and they are available in such a range of themes it makes them ideal for decorating any child's room. I've found a selection of fun looking wall decals available below including a large personalized cupcake one. There is no end to extra little pieces that you can add into the bedroom to further enhance the cupcake theme and this is really where a lot of the fun begins. I managed to find a cupcake table on Amazon (see opposite) which is simply adorable and would look great as a bedside table. 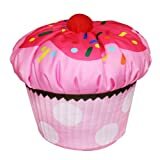 Of course if you're handing with a sewing machine you could always make your own cupcake beanbag for your daughter as there are lots of great cupcake design fabrics available. Personally I think this cupcake beanbag would be a much easier option and it looks good enough to eat! I don't know about you, but in my daughter's bedroom we always need to address storage. I really don't know how she accumulates so many things (well actually I do - I blame her grandparents and aunties!! ), but any storage solution is always welcome. I've found a cupcake ottoman available online which is cool, but another option is to simply get a plain wooden storage box and decorate it yourself. K5405 Features: -Ottoman.-Material: wood, fabric. Color/Finish: -Finish: Pink. I purchased a plain storage box similar to the one above at a local shop like Walmart or Target and turned it into a cow print box for my daughter's room (that's what she was into at the time). First I got a piece of foam cut the size of the top of the box, next I got some material to cover the lid (with the foam as well). Using a staple gun I fastened the material to the top and she had a storage box seat to place under her window. We were planning on painting the box as well, but she couldn't decide what color she wanted so we've left it plain. As I said previously there are lots of cupcake fabrics on the market to choose from, alternatively you could get some fluffy material in the room's dominant color and just use that with a cupcake throw pillow resting on top as well. Other items that you can use are cupcake lamps, clocks, jewelry boxes etc. There are so many different cupcake trinkets available you can let friends and relatives buy some of these little items and invite them to a room warming party. Just be sure to bake some scrummy cupcakes for the occasion! Very cute bedroom supplies, Lou!